Nicola Millbank, a cookbook author who starred as Ella in Mount Pleasant, has exclusively shared her perfect tomato sauce recipe. Nicola says the number one thing most people do wrong is not cooking their sauce long enough. ‘In a lot of people’s heads, you just chop up an onion, get it in a pan, brown it and pour in tinned tomatoes and that’s kind of done,’ says Nicola, who published her first cookbook, Milly’s Real Food, in this year. Nicola is currently writing a screenplay and running her Milly’s Cookbook food brand. She said the longer you cook your sauce, the better and warns that if you try to rush it, it will taste ‘metallic’. 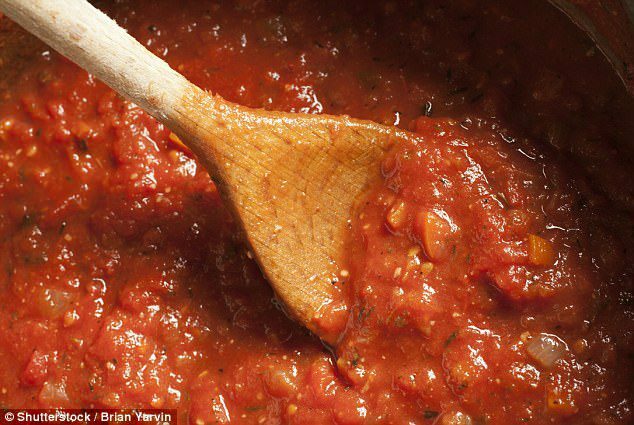 She shares her tomato sauce recipes: one for meat, and one for a plain all-purpose sauce below. 1. Start with the classic Italian trio of onions, celery and carrot diced really fine, with a couple of cloves of garlic. 2. Sweat that down, don’t brown it, until it’s really soft. 3. Add your meat – I really like to use pork and sage in a lasagne. Brown off meat and add sage then add a glug of wine. 4. Next add some whole plum tomatoes, tinned, and sweat that down. 5. Add puree, some stock, salt and sugar to counteract the acidity of the tomatoes, some chili flakes and let that bubble down for about two hours. 1. Sweat down the Italian trio with garlic, with herbs, salt, and sugar again. The longer you cook it, the better. If you do it in a rush, then you get that metallic taste that doesn’t actually taste like a good tomato sauce.